Happy 2015 and Winter Blessings………. Today is a beautiful, blue sky, sunny day but it is also a deep freeze out there! We got about 5-6 inches of snow a few days ago and since then we have had a lot of negative temperatures as well. I don’t mind it too much though. I love nesting in for cold Winter days..cause I can. I know not everybody has that luxury of not having to go out, I’m blessed that way. Freezing wind that takes your breath away and watching snow fall isn’t bad at all when you’re cozy and warm indoors. But I also like to go outside in the Winter. There is something bracing and beautiful about the quietness of Winter. The skies when clear, are so clear as to hurt your eyes. At night, the inky, cold black of the skies makes the stars and Moon shine so brilliantly. Don’t you think so? Taking walks while a soft snow falls is such a wonderful thing to do too. I posted this picture the other day from facebook on my page. I have seen it before and love it. I don’t know who the original poster of this picture is but credit is given on the picture itself for this one. 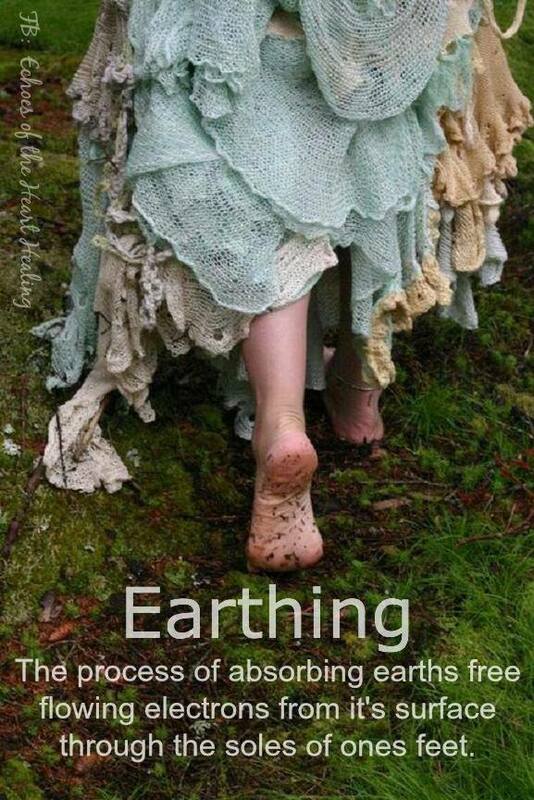 Earthing…..a concept I’ve always been familiar with but didn’t know what to call it. When I was a kid, it was for me “getting out in nature” or “sinking my feet in the ground” or “connecting with Mother Earth.” I love the term Earthing and have adopted it. When I posted this picture I asked my friends how they go Earthing in the dead of Winter with snow on the ground. I got some great answers and had a few of my own and thought I’d share them with you. For many people, Winter is a depressive time of year. The “Winter Blues” is a very real thing. Oh sure, some of us just grouse and complain about the cold and missing Summer etc (not me I don’t LOL) but for many it’s a real depression that sets in. For Witches, being outside with our bare feet in the dirt is a necessity of Life. It’s a serious need. It centers us, grounds us, lifts our spirits physically, mentally and spiritually. It’s a huge part of our spirituality. This connection to Mother Earth….not just seeing her but FEELING her. In the Winter, needless to say, being barefoot can be an issue. So here are a few ideas for those who need that connection..no matter what your Path is. *Go ahead and go barefoot. For however long you can handle it 🙂 I got that answer several times from my friends. Feel that mushy earth and cold snow under your feet. Or the hard, cold ground. Come in and soak your feet in a nice warm salt bath and your spirits will be lifted and your feet will feel great! *Go out and hug a tree. Another popular response. Feel that connection to Earth through a strong tree that stands stark and dark in the cold weather. The vibrations are there for you to absorb and feel. *Take a walk. This seems obvious to me but a lot of people don’t like walking in the snow. Of course, if there’s an inch of ice out there don’t go and hurt yourself. But bundling up and taking a brisk walk is good for you anytime. Collect some things from nature while you’re out. Pine cones, acorns, rocks, feathers, greens etc. Bring them home and place them in a bowl with a lit white candle. The scent will fill your house with outdoors. Light a roaring fire and have a hot chocolate or coffee.and you’ll feel exhilarated! *Get out your gardening books, magazines, catalogs and start planning your gardens for Spring. Perusing them, dreaming of working in your gardens will help you to remember that Spring will be here before you know it. Perhaps you can plant some seed starters and get started inside. The scent of green things growing in rich dirt in little pots should help you a lot and you’ll have an early start on your gardens. I was at Lowe’s the other day and they already have their seeds and pots out! *Keep indoor plants. Watering and tending to indoor plants keeps your hands in the dirt. Some herbs on your kitchen window sill, some large tropical or tree plants in the house are always nice. *Take a class on gardening or herbs. I’m working over this Winter and however long it takes me, on an herbalist class. It keeps me thinking of being outdoors growing my herbs, their scent, cutting and drying them etc. I still have herbs hanging in my kitchen I have dried. Rubbing my hands over them and smelling those wonderful scents keeps me in mind of warmer days with the Sun on my back, feet on the ground and hands dirty from digging. Happy thoughts indeed! *Go outside and do something fun..something adventurous! Go sledding, skiing, ice skating, ice fishing or play hockey. Get that sense of snow days that kids have. Remember that? As kids weren’t snow days just the best things in the world? We didn’t sit around bemoaning the cold….nope…we got bundled up and stayed outside until our toes and fingers were frozen, our noses were running and cheeks were bright red. But our eyes too were sparkling and our energy was abounding and we had FUN!! Do that!! *Give yourself a project to do. Perhaps de-cluttering and organizing your house. Cleaning out closets and drawers is so satisfying. Perhaps you’ve always wanted to write a book, paint, crochet, spin wool, throw a pot, play with clay, start a blog, learn yoga or meditation, etc etc. 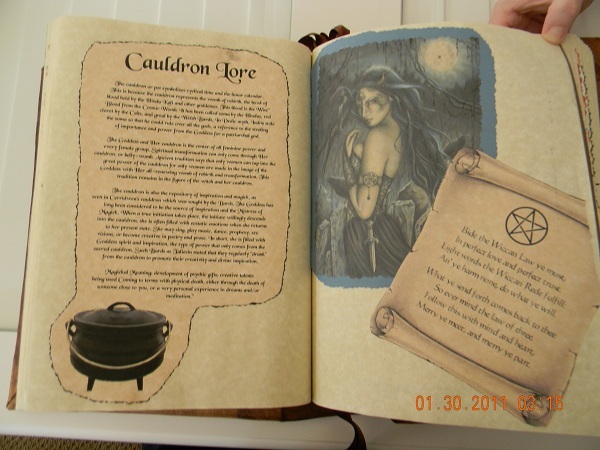 Witches can work on their grimoires or book of shadows. Keep yourself busy doing something you love. Or learn something new. You get the idea. Well, these are just a few ideas, I’m sure there are many more. Don’t let Winter become something dreary and hated that you just have to get through before the days of Sunshine and roses come back. Winter is a long season and that is a LOT of days to feel bad, feel sad, to dread. Every day is a gift, no matter the weather. Make the most of it. If being lazy and reading is all you want to do ..then good..do it. But do it cheerfully with a smile on your face okay? Blessings of the Winter season to you and may 2015 bring you all the joy and happiness you deserve! I’ll be back soon with bits of magick I’m working on here and there and of course recipes etc. Imbolc will be before we know it! The Wheel Turns to Mabon 2012………..
Merry Meet my friends! 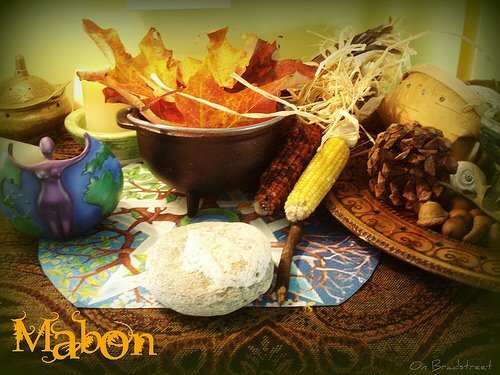 I am late posting a Mabon post this year but I have good reason! My Life has been crazy busy. We have been working hard on getting our house ready to sell. Also, we went on vacation last week! To Panama City Florida…my whole family…hubby, daughters, son-in-law and grandbabies. Took two friends with us as well to help care for my daughter Sara. We had a fabulous time….My Sea Witch Self re-emerged. Resting, relaxing, good eating, beautiful Sunrises and Sunsets, and a waning crescent Moon all made for great magick on the Beach! A good time was had by all..much needed with all we had been through this year. We were thrilled to see we were coming home to beautiful, Autumn weather. Signs of Autumn are everywhere I look now. Windows and screen doors are open during the day and nights are cool. Leaves are starting to turn, gardens are losing their color, critters are busier, birds are flocking, stores are filled with Autumn and Halloween decorations. Mums, pumpkins and Fall flowers are showing up at garden centers. My mind is turning to my slow cooker, baking, cider and apples. My clothes are changing over to long sleeves and light jackets or sweaters..and yes..even flannel jammies 🙂 Wood is piled in the fireplace and outdoor fire pit..ready to go. Ahhhhh….I am maybe..just maybe..starting to forget (a little) how miserable Summer was with it’s sweltering Heat LOL. My soul soars at this wonderful time of year! 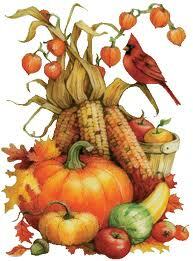 Mabon…the 2nd Harvest festival…is Saturday the 22nd. 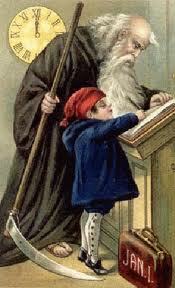 I love all the Harvest Sabbats and this one is no exception. I am planning a great meal, an outdoor by- the- fire ritual, and will be decorating my house for Autumn as well. For me, Mabon is the time to reflect on the coming dark Season. To finish up harvesting our gardens and herbs and putting our gardens to bed for the Winter. Putting the last of the bounty up..by canning or freezing. I start looking for projects to keep me busy as we come indoors more….like crochet, home projects, and of course Verbena Lane Botanicals is keeping me busy too 🙂 I also read more, journal more, work on my Book of Shadows etc…things that I can’t settle in to do during the Summer. Cooking and baking! This is my favorite time of year to cook….I’m perusing my recipe books like crazy already! To get the Mabon Correpondences and recipes I’ve posted the last few years…just do a search in the archives. I don’t think I can top the recipes I posted last year but I’m searching out one or two more to post in the next day or so for you. “Leaves fall,the days grow cold. I hope you all have a wonderful week and would love to hear YOUR plans to celebrate this Sabbat. I am off to get out my favorite cookbooks and see what I can find 😉 Happy Moon day and Mabon Blessings! Merry Meet my friends! Hope you all have had a wonderful weekend. Imbolc is just a few days away. As I have posted here, I have been busy with my cleaning and organizing and getting ready to invite the Celtic Goddess Brighid into our home and to celebrate the coming of Spring. Monday, I will do the more “everyday” cleaning like dusting and sweeping and wiping down bathrooms etc. Tuesday I will smudge the house good. Wednesday..Imbolc..which is also the New Moon by the way….I will spend time celebrating with my family. That night I will be doing a ritual and lighting candles all over the house..and throwing open the doors to invite Brighid and all the good that Her coming brings. 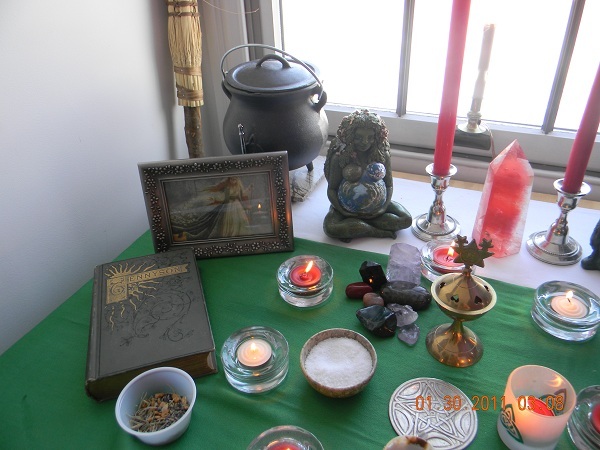 When I posted about Imbolc on a previous blog post, I wrote all the correspondences for this Sabbat. When I put together my altar..I kept those in mind of course. My altar cloth was a simple white cotton cloth. I threw a green scarf across it to represent Brighid’s Mantle. 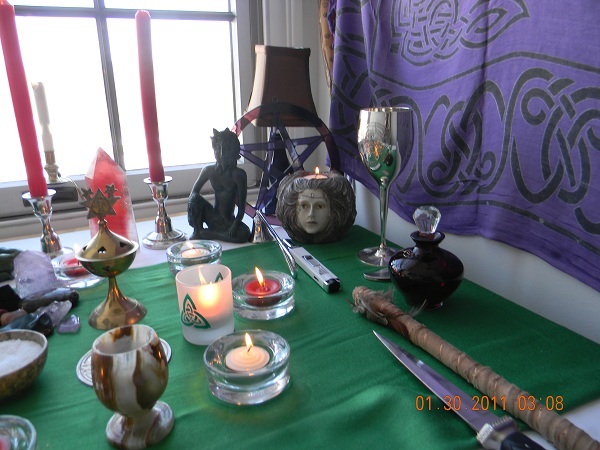 I then put all the tools that are always on my altar, my athame, wand, cauldron, elemental representative of candle, incense, salt and blessed water. 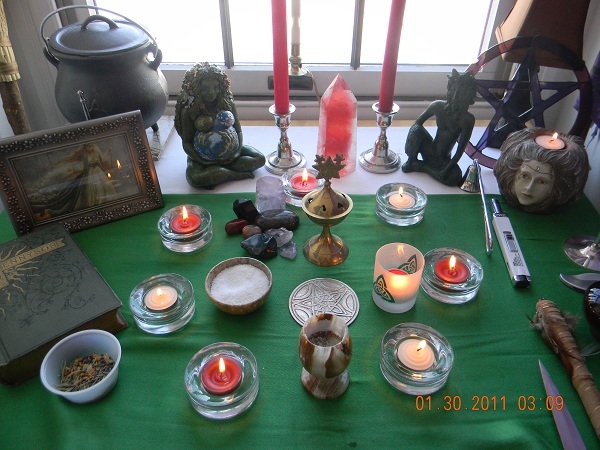 My pentacle tile and statues of Gaia and Greenman which are definitely appropriate for Imbolc. I then added my Goddess/God candles..red and my Fire candle is also red. I place crystals of Amethyst, bloodstone, garnet, onyx, moonstone, and red jasper. I have a gorgeous cherry quartz point in the center of my candles. I have a bit of sunflower seeds and some healing herbs there as well. I have a printed picture of Brighid in her Maiden aspect..beautiful as I picture her. A poetry book to represent her being the Goddess of poetry. Silver candlesticks and celtic symbol to represent her being the Goddess of smithcraft and honoring her being Celtic (as am I!). My potted daffodils and cakes and ale will be added when I’m ready to work at my alter. I’m making the Lemon Poppyseed Bread I posted here..and I’m going to have spiced wine to drink. I also have added 7 tealight candles in red and white…those are for one of the rituals I’ll be doing Imbolc night…along with some special sisters of mine. I look forward to working at this beautiful altar which I find magickal and beautiful. 🙂 After looking at this, I realize I forgot my lamb statue..I’ll add that in also..remember Imbolc means ewe’s milk. 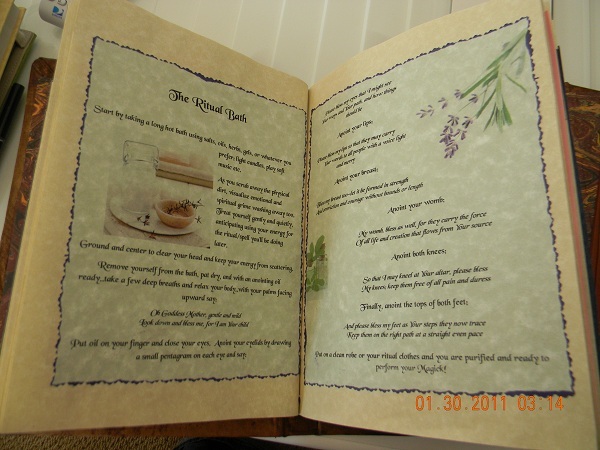 I have been spending time when I can adding to my Book of Shadows…it seems to be a never ending process. I am always adding information from books I’m reading, or from my facebook friends or from groups I belong to on facebook, and from the internet. I DO use my computer to make up my pages. Now I know that can be a controversy…many will say it should be all handwritten. 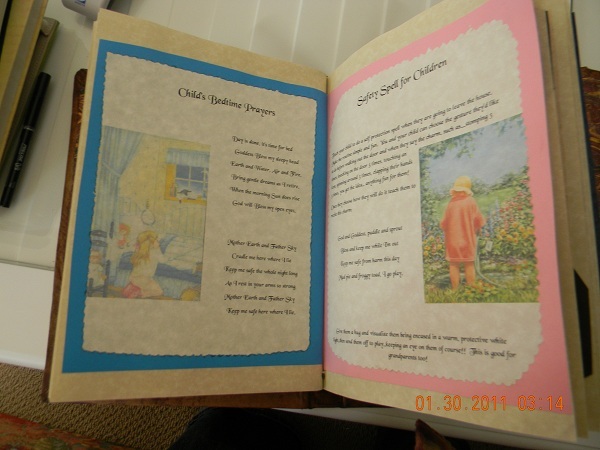 But my BOS is a very beautiful, fairly expensive book..and I have terrible handwriting…I want not only for me to easily read what is there..but I plan on passing down this book to my children and grandchildren and I want them to be able to read it as well. I love being able to change the fonts, the print size, add pics and flourishes. 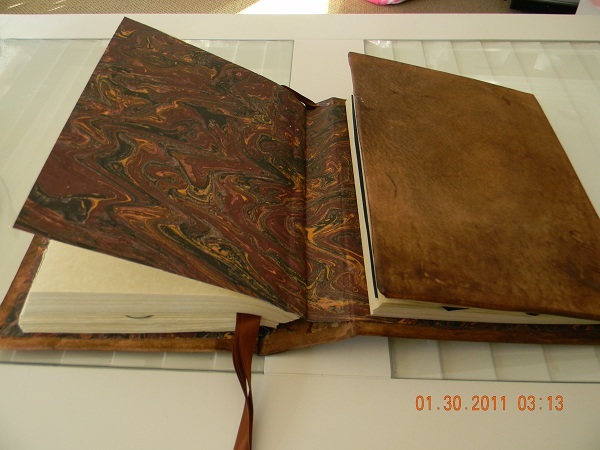 There is some of my handwriting in the book..I make notations, add info etc in my own hand. 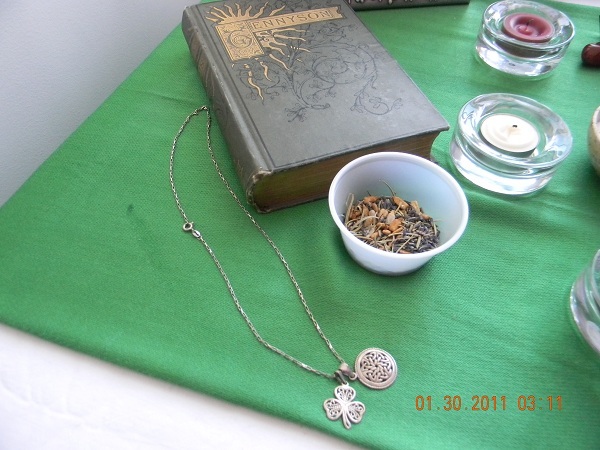 When I look at my altar and my Book of Shadows…I feel so much pride and inspiration. I try to live my life everyday in a way that speaks to my soul, that makes me happy, that honors the Divine, Mother Earth, the Elements. I am proud of my path! Being a Witch, discovering my true self…has been Goddess sent…I am soo blessed to have the joy of all that this path I’m on entails. I know so many of you know exactly how I feel. When my day isnt’ the best day, or my mood is poor, or I feel overwhelmed, all I have to do is have a sit at my altar, or go outside. Light a candle, or grab a crystal. 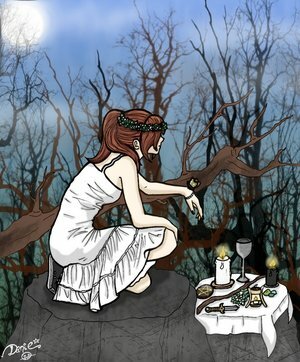 I can read one of any beautiful inspiring quotes or poems in my BOS or just connect with the Goddess by sitting quiet and listening for Her message. And then there’s the Moon! Ahh the Moon…how wonderful that we are so aware of Her mysteries, Her energy, Her power. How wonderful to be a Witch! If you’re like me, pretty quick after the last present is open and the feast is over and everything put away…it’s time to think about taking down the decorations! LOL! For me this starts immediately. All of the sudden I feel the need to clear out all the clutter that I find so beautiful and charming when the holiday season starts. I want to put it all away, de-clutter, organize, clean. 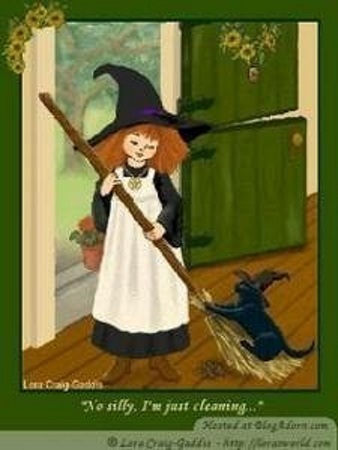 As a witch, I also start thinking about clearing the house of the stale air and any negative energy. I start thinking of projects I can work on during the long winter ahead. We are heading for the New Moon as well soon. Want to start a new project for winter? The New Moon is the perfect time for that as all witches know! I am going to tackle my attic to get rid of junk, turn a never used sewing room into a room for my grandkids, make a quilt for my granddaughter’s big girl room, and work on my Book of Shadows…seriously work on that! I will catch up on reading as I will have more time to do that and will start working on making some herbal remedies I’m in need of as well. I know alot of people don’t love Winter, but I say it’s an opportunity to both relax and reflect, and a time to get your home organized and cleaned out for the coming spring. Winter gives you time to work on those projects that you always want to do but don’t seem to have the time to do. What will you do this winter? What would you like to accomplish? Find something to look forward to, don’t let the blues or the “I’m so bored” take over! Think about spring coming..maybe you’d like to peruse gardening books and plan your garden. Paint a room a pretty spring color like yellow or green or lilac. Work on your BOS or make up some lotions and potions. All of these things will make winter go faster and be more enjoyable and you’ll feel so good and so accomplished! I hope these are things I can “do” everyday…hopefully without even giving it a thought..that it just comes naturally. Have you thought about resolutions? Things you’d like to bring into your life, that you want to change about your life? Now is the time! Tonight is the full moon of March ..this year called the Storm Moon. I unfortunately can’t see the moon as we are under a very cloudy, dark, dismal sky all day today and continuing into the night. Tomorrow its supposed to clear up and the sun is coming out and its warming up..so I’ll be doing my full moon spellwork tomorrow night, out on my porch. I like to recharge my crystals and silver jewelry in the light of the full moon. I also will be making up some Blessed Water. I bought a beautiful bottle to put it in and can’t wait to use it. The Storm Moon is perfect for performing cleansing, purification and healing spells too. 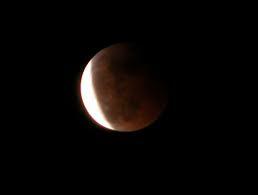 So putting your altar ritual tools out in the moonlight will cleanse and purify them until the next full moon. 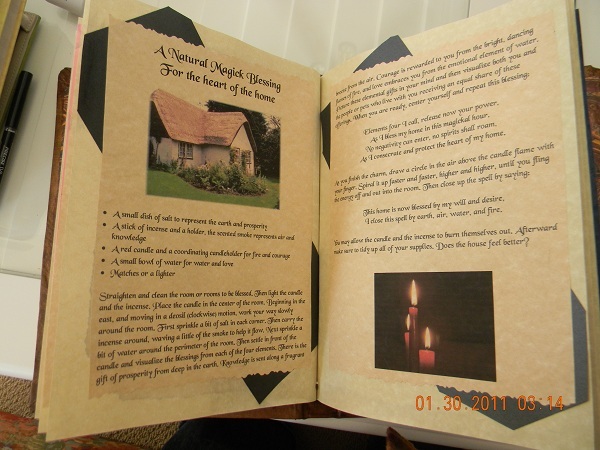 The best news I have to tell you is that I finally received my beautiful Book of Shadows from Witches Moon. It took 7 months which seemed like forever but it was well worth the wait! My book is everything I dreamed it would be and more. 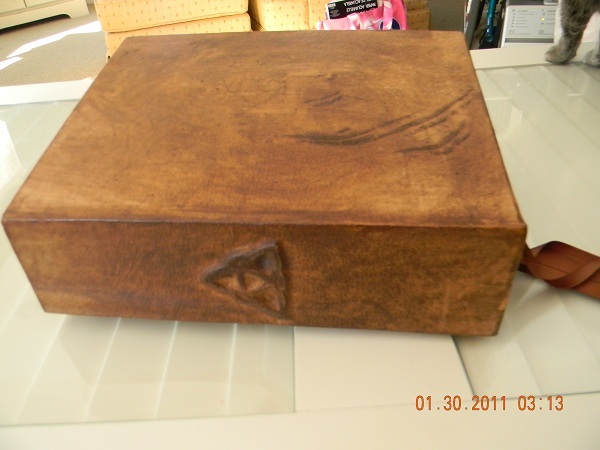 It looks aged, it smells great, the paper and leather are awesome and my triquetra on the binding looks amazing. I have started working on getting my pages I’ve worked on for months in the book, deciding what goes where etc. It’s going to take a while but I believe my Book will be a a real heirloom to pass down to my grandchildren in time and something I’ll be proud of and cherish. I’ve also now ordered a smaller version of it for a herb book..hope it doesn’t take 7 months for it to get here! I ordered one for my daughter Willow also. She is still waiting for her book of shadows to come..my other daughter Luna, sister Teagan have received their books now too. Poor Willow, she ordered hers first and its still not here! Today I got my herbs planted in the little paper pots, made up cute little herb markers and got them in the window where the Sun comes shining in the mornings. Can’t wait to see how they start sprouting. 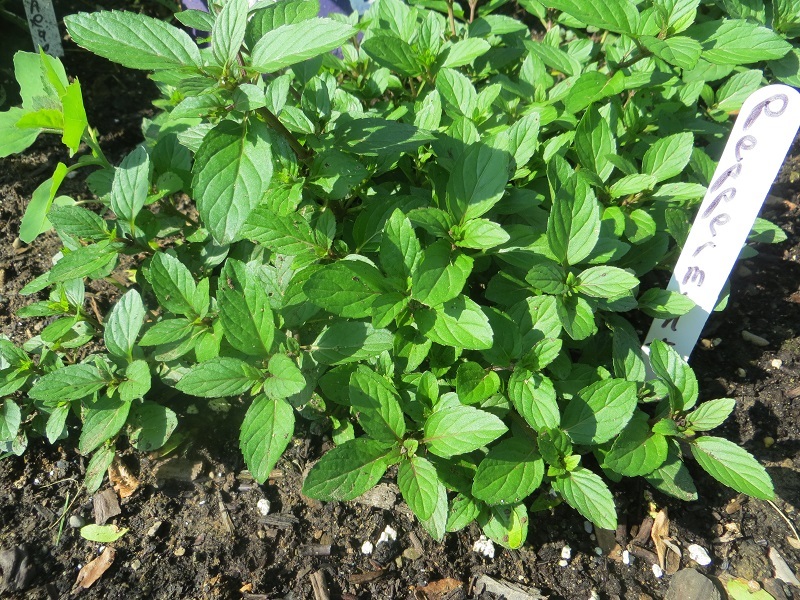 I’ll plant them in large patio pots probably around Beltane (May 1). I planted a few veggies too but mostly herbs. 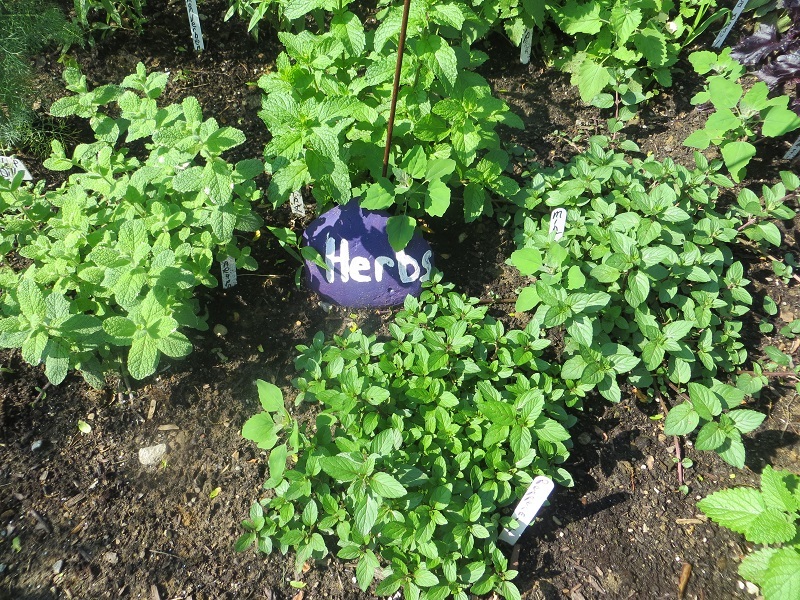 How wonderful it’ll be to go out and pick my own fresh herbs for cooking and for spellwork.